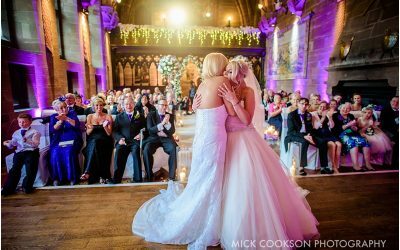 Donna & Leigh were married in the New Year at Peckforton Castle – ironically my last wedding of 2015 was also at this brilliant Cheshire wedding venue! Being January, the weather was as to be expected; glorious….until the afternoon. Luckily we were ‘under one roof’ for this wedding, so getting outside wasn’t actually high on Donna & Leigh’s list of priorities. Their brief to me was to capture the day, and just ‘do my thing’…ok then! Here’s a few photos from my latest Peckforton Castle Wedding Photography. Congratulations to Donna and Leigh, and thank you for having me on board. It was a wonderful winter wedding this one!